I am hoping you could help with a problem I have. I plan to make a basic 3 tiered (10, 8, 6) cake with butter cream frosting that I purchased commercially. My question is this...I am attaching the picture my daughter fell in love with and while it is simple (which is the only reason I offered!) I am finding attaching the sugar crystals more difficult than I realized. Are these a special kind/size of crystal? 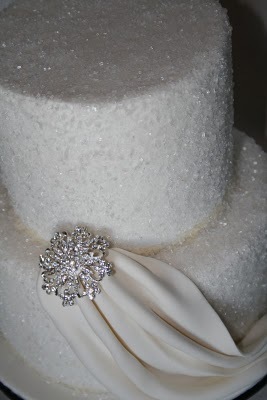 I would not only like to get them to adhere to the frosting, but to still look pretty and sparkly. Do you have any suggestions? Obviously, the most difficult part is the sides. Can I finish the decorating the day before and put it in a refrigerator? Will that cause any condensation or problems when it is taken out and put on the cake table? I'll probably regret offering to do this but she really wants me to so I hope all goes well. if you were decorating the sides with crumbs. Or as you turn the cake on a turntable toss the sugar on and let them land randomly. I prefer the first method as it will coat it nice and thick. the buttercream icing has to be soft enough to hold the crystals, but not so soft that the crystals get lost in the frosting. You will need a lot of this product to coat the cakes. They come in small jars, so be prepared to spend a bit on them. Be cautious with refrigerating the cakes once the crystals are on. Experiment with a cupcake or something to be sure that the condensation will not ruin the sparkles etc. Yes there can be condensation formed on your cakes if it is especially hot or humid. So you may want to opt to keep the cake once decorated in a box covered and in a cool room or basement instead of a cold refrigerator. Your cakes will be fine if you are using buttercream filling. You may feel like you are regretting it while you are in the process, but in the end, if all turns out well, and it will :-) you will be VERY proud and happy that you took on this challenge. Please share a photo and your cake story once it is over. I would love to see and hear all about it and so would all of the visitors who come here to find ideas and get advice. Thank you and the best of luck to you and your daughter. I use them on all of my cakes. They add such a nice 'glow' and I do it right at the very end before boxing it up. Well, the wedding was wonderful! A beautiful day, everything was great! My daughter said it was her dream come true wedding...you can't ask for more than that! I did make the cake, adhering the sugar crystals as you recommended in your first suggestion, by layer, by hand as I turned each layer. I did not use Wilton sugar crystals...I used sugar crystals that I bought at an Asian market...it comes in larger quantities than the Wilton bottles. I thought I would need a lot! It worked really well and I was happy with the final product. It did not look like a professional cake but it was pretty and my daughter was happy with it. It got quite warm so the perfectly smooth sides got a little melty looking by the time it was cut. I got MANY compliments on how delicious it was and that was great! I would not probably undertake this project if I had to do it over only because the time I spent working on the cake that day, I could have been spending time with my beautiful bride daughter. Thank you for your suggestions and help...I spent a lot of time reading tips on this site! I'm sure the cake was gorgeous and thank you for adding the tip on getting the sugar crystals in larger amounts at the Asian market. Congratulations to you and your daughter!!! You making her cake was a VERY special gift. How much of the sugar crystal do you need for a three part wedding cake ? I bought the sugar crystals at an asian market in a bag...probably 6-8 oz. I'd guess 2 of the bags should cover a 3 tiered cake. They're not very expensive...buy more if you feel like you want to be sure.